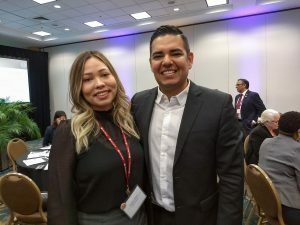 Senior Megan Anaya’s internship in Fall 2018 with Centro CHA resulted in Long Beach’s first Latino Economic Impact Profile Report and attendees gathered with city leaders, such as Mayor Robert Garcia (pictured above) to discuss how the Latino population contributes to the regional economy. Senior Megan Anaya’s internship in Fall 2018 with Centro CHA has not only helped her solidify her career goals but was also central to the completion of the first ever Long Beach Latino Economic Impact Analysis. As a research intern, Megan compiled an extensive employment database for use in mapping the extraordinary economic contributions made by Long Beach’s Latino Community. This is the first time the city has created an economic profile and examined economic impact for a specific ethnic group. Results of Megan’s analyses were presented at the Latino Economic Summit held in November 2018 and will be used by the city as a model for examining the impact of other ethnic groups. As noted by her mentor and internship supervisor Dr. Seiji Steimetz, Chair of Economics at CSULB, “Megan exemplified how classroom learning can be used to solve real-world problems. It was so rewarding to watch her convert massive amounts of raw data into concise and tractable results for use in policy analysis and decision making. It was equally rewarding to watch her grow intellectually and professionally in the process.” As noted by Dr. Steimetz, private consulting firms typically charge thousands of dollars for the quality and complexity of work that Megan contributed.